We all know that you can't rely on Machine Translation alone, but when used in moderation, it can actually be a great resource for translators. 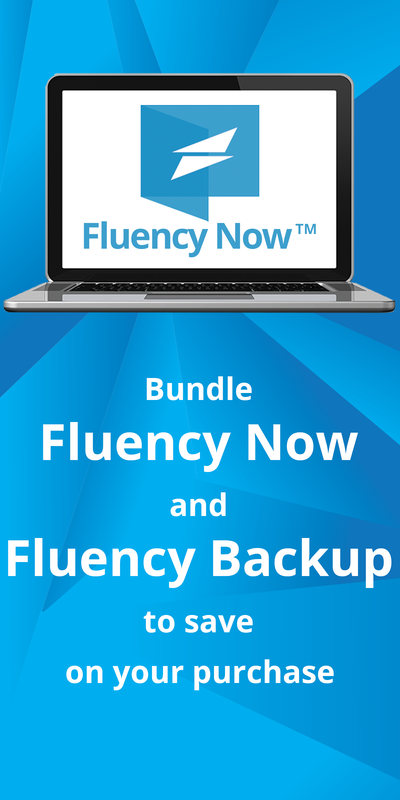 Fluency Now offers you the ability to work with one (or more) of the most popular machine translation providers available. Our innovative layout allows you to see the machine translated text, then modify any part of it for a better grammatical fit in your document. Step 1: Open Fluency, then click on Tools > Preferences > Machine Translation Settings. Step 2: Check the box to ‘Enable Machine Translation lookups’, then you’ll be able to choose from one or more of the supported MT providers. These include Microsoft, Google, Translated.net (MyMemory), Systran, iTranslate4, and World Lingo. 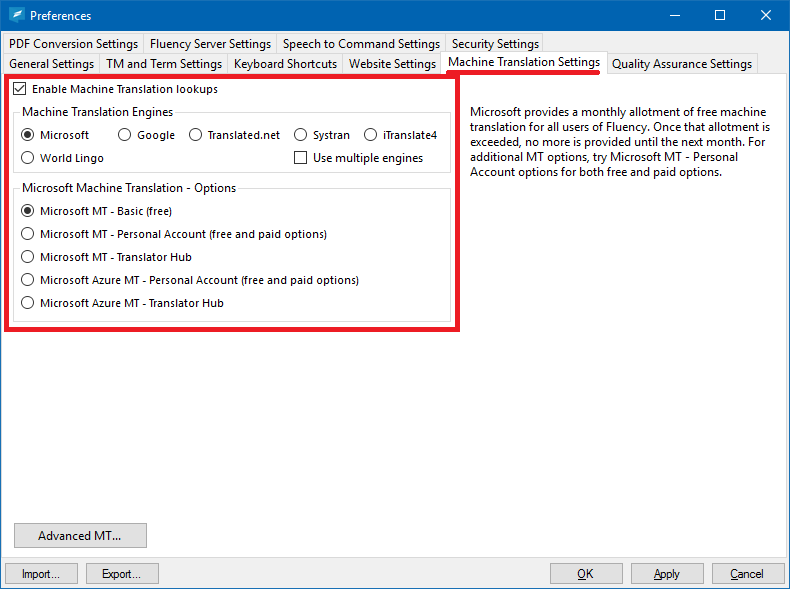 Microsoft and Translated.net offer free options, while the rest require a paid account. Please note that some provider screens have notes associated with them. It’s important to read these notes in order to understand how their service works or how to sign up for their service. Step 3: If you’d like to use multiple MT providers concurrently, check the ‘Use multiple engines’ box. Upon doing so, you’ll be notified that you’ll need to set up multiple MT usage on each provider you’d like to use together. Next you’ll need to check the ‘Use with other MT engines’ button on each provider you’d like to use. Step 4: After selecting each desired MT provider, click the OK button. Now your MT results will come from the providers that you’ve selected. If you’re using one MT provider, the results will appear directly in the Translation window. If you’ve selected more than one provider, you’ll see a Machine Translation resource tab which will contain a translation from each of your preferred providers. 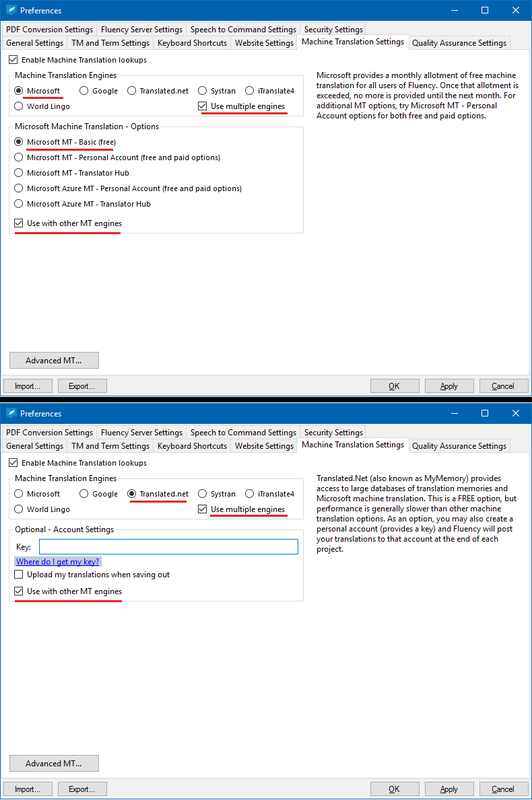 Step 5: If the machine translated text isn’t quite grammatically correct, or if you’d like to change it to make it flow better with the document you’re working on, you can do so directly in the Translation window. Simply click in the Translation window to place the cursor where you’d like to begin, then make your edits as you would in any other word processing program. 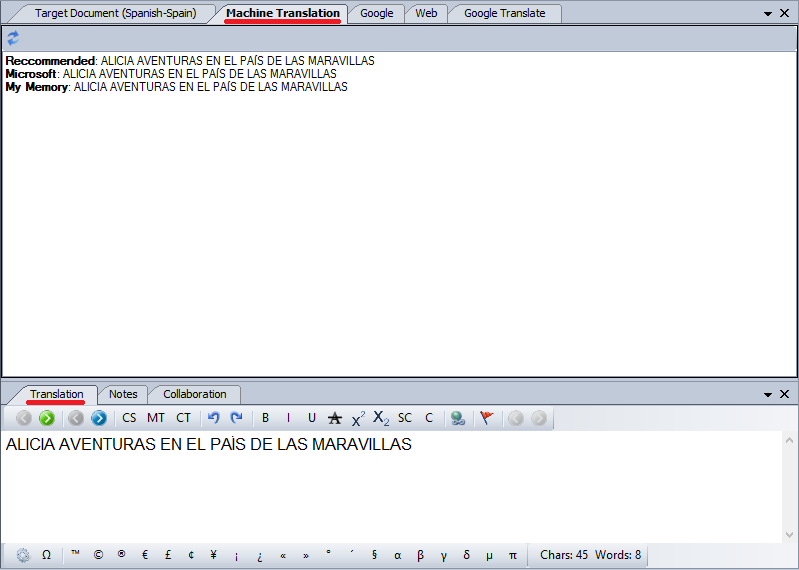 Once you’ve finished your edits, press Enter to move to the next segment and continue translating your document as usual.